Samsung televisions feature some of the most innovative visual technology available for sale in 2018. Whether you are seeking an affordable 4K UHD smart television with high dynamic range capabilities or are interested in cutting edge Quantum Dot technology, you can select a Samsung model that will suit your viewing preferences. 1. What is a Samsung television? Samsung was the first brand to launch a high dynamic range model in 2015. Today, the brand has a proprietary ultra-high-definition upscaling picture engine that optimizes the quality of all visual content. Samsung continues to innovate with Quantum Dot LED technology. 2. What do Samsung televisions do? These televisions combine top-quality parts with innovative color and high-definition technology to provide the clearest and most vibrant visuals possible. Premium and QLED models also feature the brand's Bixby voice assistance. 3. How does a Samsung television work? This brand's televisions have power buttons and rely on remotes unless you sync a compatible smartphone with a Premium or QLED model. 4. Where can you buy a Samsung television? Purchase a Samsung television directly from the manufacturer, from an audio-visual specialty store or electronics retailer, or from an authorized online vendor or marketplace. 5. How much do Samsung televisions cost? Customers may spend as much as $19,999.99 on an 88-inch Q9F series QLED television or as little as $179.99 on a 32-inch flat screen with 720p resolution. Customers may spend as much as $19,999.99 on an 88-inch Q9F series QLED television or as little as $179.99 on a 32-inch flat screen with 720p resolution. Our unbiased ranking focuses on the alignment of features and value. We showcase the best television models in 2018 that will continue to be competitive for several years to come. For this reason, we exclusively feature 2160p 4K UHD televisions with HDR compatibility. Some of these models have standard or premium LED screens, while others feature Quantum Dot or QLED color technology. Our top-ranked television model provides the best features for the price. The televisions in our ranking range from $329.99 up to $1,799.99. Lower-end models have standard LED technology and limited smart features. More expensive models tend to have larger screen sizes, QLED technology, voice assistance, and other smart features. The 65-inch model in the NU7100 series combines a large screen size with 4K UHD resolution and HDR capabilities. This basic smart television provides everything that most consumers are looking for at a reasonable price. The MSRP of model UN65NU7100FXZA is $999, but this model sells for $849.99 in most electronics stores and online marketplaces. Purchase this Samsung television from the manufacturer, electronics stores, or online vendors. Samsung covers all new televisions with a one-year parts and labor warranty. This Q-series Samsung television combines Quantum Dot color technology with high dynamic range capabilities. Q Smart features including Bixby voice assistance allow users to sync this television with their smartphones for easy control. Ambient mode lowers power consumption and camouflages the screen to the color or pattern of the wall on which this display is mounted and can display helpful data when not in use. This model also boasts Dolby Digital Plus DTS Premium 2.1-channel 40W sound and Motion Rate 240 technology. This Q6F series model has an MSRP of $1,999.99 but is available for sale for $1,699.99 from electronics retailers and online stores. Purchase this Samsung QLED television from electronics stores, audio-video specialty retailers, or online vendors. Parts and labor for Samsung televisions are covered by a one-year manufacturer's warranty. The NU8000 series of premium 4K UHD televisions feature Bixby voice assistance, dynamic crystal color, and HDR Plus resolution with Motion Rate 240 technology. The 65-inch NU8000 model has an MSRP of $1,599.99 and retails for $1,299.99. Purchase this Premium Samsung television directly from the manufacturer, an electronics store, or an online marketplace. Samsung provides a one-year warranty of parts and labor coverage for all televisions. The NU6900 series offers great deals on smart UHD televisions with HDR capabilities. This 50-inch model has 2160p 4K UHD resolution with Motion Rate 120 technology and Dolby Digital Plus sound for an affordable price. The NU6900 series 50-inch model UN50NU6900FXZA has an MSRP of $449.99 and is currently priced at $399.99. Purchase this model from Samsung, electronics retailers, or online vendors. This model comes with a one-year limited parts and labor warranty. This smaller QLED television is in the Q8F series and features Q Elite Contrast with a full array backlight and anti-reflective screen. A 55-inch Q6F model is available for about $700 less, but the quality of the visuals and viewing angles make this Q8F model noteworthy. The Samsung 55-inch QLED television has a recommended sale price of $2,199.99 but currently sells for $1,799.99. Purchase Samsung televisions from the manufacturer, authorized web vendors, audio-visual specialty retailers, or electronics stores. Model QN55Q8FNBFXZA is covered by a one-year parts and labor warranty. This 75-inch NU7100 series 4K UHD television by Samsung has the largest screen size in our ranking and is priced under $1,600. The UHD engine optimizes lower-quality content to 2160p 4K resolution. The NU7100 75-inch Samsung television has an MSRP of $1,799 and currently sells for $1,599.99. This model is $600 less than the Premium version with voice assistance. Purchase the NU7100 series 75-inch television from an electronics store, online marketplace, or directly from the manufacturer. Samsung model UN75NU7100FXZA comes with a one-year warranty that covers parts and labor. Samsung's curved UHD 4K HDR televisions boast Auto Depth Enhancer, which varies contrast to improve the depth of on-screen images. Customers that prefer this immersive shape should consider model UN55NU8500FXZA. The 55-inch model UN55NU8500FXZA has an MSRP of $1,199.99 and can be found for $999.99. Purchase this model directly from Samsung, at an electronics store, or online. Samsung televisions come with a one-year limited parts and labor warranty. This 55-inch 2160p 4K UHD Quantum Dot model is more affordable than the 65-inch and 55-inch QLED and QLED Elite models, which were ranked second and fifth on our list. This customer favorite is $700 less than the 55-inch Q8F series model. This 55-inch Q6F series Samsung QLED television has a recommended price of $1,299 and is currently available for as low as $1,299.99. Purchase model QN55Q6FNAFXZA from online marketplaces, electronics stores, audio-video specialty retailers, or directly from the manufacturer. Parts and labor for this model are covered by a one-year manufacturer's warranty. Customers seeking an affordable 2160p 4K UHD television should consider this 43-inch model. Samsung NU6900 televisions are basic smart televisions with vibrant screens available for a lower price than Premium UHD or QLED models. 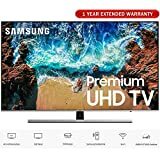 Series NU6900 model UN43NU6900FXZA is one of the most affordable 4K UHD HDR Samsung televisions, with an MSRP of $379.99 and a current sale price of $349.99. Purchase this model directly from Samsung, at electronics stores, or authorized vendors on online marketplaces. Model UN43NU6900FXZA is covered by a one-year limited parts and labor warranty. The MU6290 series 40-inch television has a 2160p 4K UHD resolution with HDR capabilities. This model has a smaller screen size and lower price point than most of the other Samsung televisions in our ranking. This affordable model has a recommended price of $449.99 but may be available for sale for as low as $329.99. Purchase the UN40MU6290FXZA model from electronics stores or online vendors. This model is covered by a one-year limited parts and labor warranty. Select the right Samsung television by factoring in the features you want and the price you are willing to pay. If you are shopping for a 4K UHD television with HDR capabilities, don't overlook our top-ranked NU7100 Series 65-Inch Class model UN65NU7100FXZA priced at $850. For an introductory Quantum Dot model, it's hard to beat the Q6F 55-Inch 4K UHD QLED TV with HDR (QN55Q6FNAFXZA), which retails for approximately $1,100, or choose another model in the Q6F series. If you are seeking a cutting edge QLED television, consider the Q8F 55-Inch 4K UHD QLED with HDR or other models in the Q8F or Q9F series. If affordability is your top priority, you may be tempted to purchase a basic 32-inch LED television with 720p or 1080p resolution. You can find these Samsung televisions for under $200 but they are not likely to have 4K UHD, and may quickly become outdated. Invest in your ability to enjoy clear and bright visuals in 2018 and years to come with one of the three $300 to $400 models in our ranking. Previous articleIs Sling TV Worth It, or Are There Better Options for You?